Looking for a guy-friendly hat design? This crochet visor beanie pattern could be the perfect fit! A crochet visor beanie is a great casual hat choice for both guys and gals. The Backloop Visor Beanie pattern is written in sizes from teen to adult. If you’d like to use a different yarn you’ll need 108 -- 138 yards (55 -- 70 grams) of a worsted weight. Adjust hook sizes as necessary to achieve gauge listed below. 13 single crochet = 4” using size H/5mm hook. All sizes are worked the same (with identical st count) until Rnd 6 has been completed. Ch 3, sl st to 3rd st from hook to form rnd. Foundation Rnd: Ch 1 (counts as 1st sc), work 7 sc into center of rnd, sl st to beg ch to end – 8 sc. Rnd 1: Ch 1 (counts as 1st sc), sc tbl in same sp, *2 sc tbl in next st; rep from * 7 times – 16 sc. Rnd 2: Ch 1 (counts as 1st sc), sc tbl in same sp, sc tbl in next st, *2 sc tbl in next st, 1 sc tbl in next st; rep from * 7 times – 24 sc. Rnd 3: Ch 1 (counts as 1st sc), sc tbl in same sp, sc tbl in next 2 sts, *2 sc tbl in next st, 1 sc tbl in next 2 sts; rep from * 7 times – 32 sc. Rnd 4: Ch 1 (counts as 1st sc), sc tbl in same sp, sc tbl in next 3 sts, *2 sc tbl in next st, 1 sc tbl in next 3 sts; rep from * 7 times – 40 sc. Rnd 5: Ch 1 (counts as 1st sc), sc tbl in same sp, sc tbl in next 4 sts, *2 sc tbl in next st, 1 sc tbl in next 4 sts; rep from * 7 times – 48 sc. Rnd 6: Ch 1 (counts as 1st sc), sc tbl in same sp, sc tbl in next 5 sts, *2 sc tbl in next st, 1 sc tbl in next 5 sts; rep from * 7 times – 56 sc. Size Small/17” – Proceed to Work Even section. Rnd 7: Ch 1 (counts as 1st sc), sc tbl in same sp, sc tbl in next 6 sts, *2 sc tbl in next st, 1 sc tbl in next 6 sts; rep from * 7 times – 64 sc. Size Medium/19.5” – Proceed to Work Even section. Rnd 8: Ch 1 (counts as 1st sc), sc tbl in same sp, sc tbl in next 7 sts, *2 sc tbl in next st, 1 sc tbl in next 7 sts; rep from * 7 times – 72 sc. Size Large/22” – Proceed to Work Even section. You have now worked 6 (7, 8) rnds and should have increased your st count to 56 (64, 72) sc. Rnd 1: Ch 1 (counts as 1st sc), 1 sc tbl in each st to end of rnd, sl st to beg ch to join – 56 (64, 72) sc. Repeat this rnd until your hat is 6.5 (7, 7.5) inches measured from the center of crown to edge, or until desired length. Last Rnd: Ch 1 (counts as 1st sc), 1 sc tbl in next 28 (32, 36) sts, place locking stitch marker on hat between st you just worked and next st, 1 sc tbl in next 28 (32, 36) sts, sl st to beg ch to join – 56 (64, 72) sc. Cut yarn and weave in end. 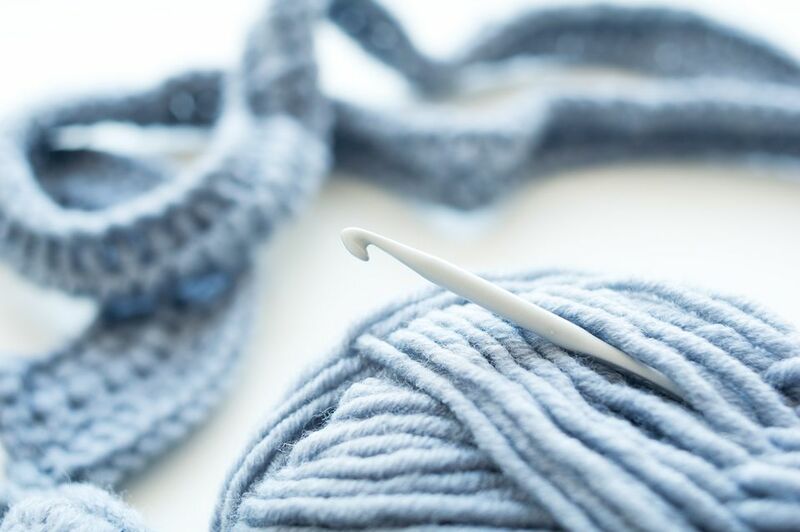 With smaller hook and rs of your work facing you, attach yarn 13 (15, 16) sts to the right of your placed stitch marker. Row 1 (rs): Ch 1, sc in same sp, sc in next 26 (30, 32) sts, turn. Row 2 (ws): Ch1, sc in next 26 (30, 32) sts across row, turn. Row 3: Ch 1, sc in next 22 (25, 27) sts, turn. Row 4: Ch 1, sc in next 18 (20, 22) sts, turn. Row 5: Ch 1, sc in next 14 (15, 17) sts, turn. Row 6: Ch 1, sc in next 10 (10, 12) sts, turn. Row 7: Ch 1, [sc 2 tog] twice, sc in next 2 (2, 4) sts, [sc 2 tog] twice, turn – 6 (6, 8) sts. Row 8: Ch 1, sc in next 6 (6, 8) sts. Row 9: Ch 1, [2 sc in next st] twice, sc in next 2 (2, 4) sts, [2 sc in next st] twice, turn – 10 (10, 12) sc. Row 10: Ch 1, sc in next 10 (10, 12) sts across row, ch 5 (6, 6), turn – 10 (10, 12) sc + 5 (6, 6) ch sts. Row 11: Sc in 2nd ch from hook and next 3 (4, 4) ch sts, sc in next 10 (10, 12) sts, ch 5 (6, 6), turn – 14 (15, 17) sc + 5 (6, 6) ch sts. Row 12: Sc in 2nd ch from hook and next 3 (4, 4) ch sts, sc in next 14 (15, 17) sts, ch 5 (6, 6), turn – 18 (20, 22) sc + 5 (6, 6) ch sts. Row 13: Sc in 2nd ch from hook and next 3 (4, 4) ch sts, sc in next 18 (20, 22) sts, ch 5 (6, 6), turn – 22 (25, 27) sc + 5 (6, 6) ch sts. Row 14: Sc in 2nd ch from hook and next 3 (4, 4) ch sts, sc in next 22 (25, 27) sts turn – 26 (30, 32) sc. Row 15: Ch 1, sc in each st across row – 26 (30, 32) sc. Fasten off yarn leaving a long tail for sewing. Fold brim in half toward the right side of the hat. Sew the long edge of the brim in place to the main portion of the hat. Do not fold the brim under as it will cause the visor to fall in your eyes. After the brim is sewn down, attach yarn to one side of it. Work sc sts around the edge of the visor to hold material together and smooth over the stepped look of the sts. If your edges still look jagged after one row you can work a second row of sc. Fasten off yarn and weave in all ends.